Pigeon toes (also called intoeing), is the term we use to describe walking with your feet turned inward. It happens in up to a third of young children, and is usually caused by the shape of their growing bones. It usually goes away by the time a child is 16, when they stop growing. 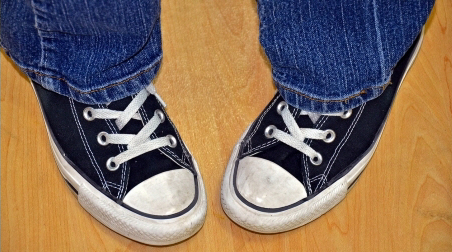 Pigeon toes often run in families. Parents often worry about a child with pigeon toes, especially if people comment that they look awkward when running. Some people also think pigeon toes make children trip up more, but there's no evidence that this happens. The cause of pigeon toes can be in three places: your child's feet, their lower leg, or their thigh. The outside edge of most feet is straight, but some children's feet curve inwards. This is called metatarsus adductus (met-are-tar-suss a-duck-tuss), and is thought to be caused by the position they were in while developing in their mother's womb. If your child's feet seem to be curved, it's important to take them to a GP or podiatrist to check that it's not caused by something else, such as club feet. When children have metatarsus adductus, their feet are generally very supple and can be straightened with gentle pushing by a doctor, physiotherapist, or podiatrist. Most children with this condition grow out of it by the age of 3 or 4, without any treatment. Some stretching may help babies with a more pronounced curve. While it's not necessary to do this, some families do feel it helps. The stretches are simple and your doctor, physiotherapist, or podiatrist can show you what to do. In very rare, extreme cases a child's feet don't straighten, and they may be put in a cast for about six weeks. At first the cast may need to be changed every week, which is usually done at the orthopaedic outpatients clinic. This generally corrects the shape of the child's foot. In some children the shin bone (or tibia) in their lower leg turns inwards. This is called internal tibial torsion. It's common in babies and children, but children usually grow out of it by the time they're 8, without any treatment. Some children have a thigh bone (femur) that turns in. This is called internal femoral torsion or femoral anteversion. All children have this when they're born, but it gradually goes away as they grow. It usually gets better by the time the child is 10, but it can continue improving until they stop growing, between the ages of 14 and 16. Children with this condition often sit on the floor with their knees in front of them and their bottom between their feet, like in the photo below. This is sometimes called the 'W position'. Older children may run with their heels kicking outwards and their knees facing inwards. Sitting in the W position doesn't appear to cause any long-term harm. Children with femoral torsion sit like this because it is comfortable for them, and they may not be able to sit cross-legged on the ground – or be uncomfortable when they do. They may be more comfortable sitting on a chair. Sometimes this condition can be a sign of something more serious, such as cerebral palsy or a dislocated hip. This is especially the case if one side is different to the other. If these cases, it's important that your child gets the right treatment. What should I do if my child has pigeon toes? If you're worried about your child's walking – especially if they're becoming more pigeon-toed or uneven, or they're limping – take them to a GP, podiatrist, or physiotherapist. They will check your child to see if their pigeon toes are normal for their age, or if there might be a problem. If they think there is a problem, they may refer your child to a specialist. However, they're unlikely to refer your child before the age of 8. There are some things you can do yourself that may help your child grow out of the condition. Make sure your child has well-fitting shoes. Encourage them to avoid sitting in the W position. However, if this is what is comfortable for them you don't need to stop them altogether. Get them to stretch their hamstrings. Figure 4 on this page of leg exercises for children shows how to stretch a child's hamstrings. For young children, make a game of bear walking (walking on their hands and feet) and penguin waddling (walking with their feet turned out). These will help to stretch and strengthen the muscles that aren't strong or flexible enough. Teach them to ride a bike. When should I see a health professional? the problem continues past the age of 8. These things may indicate that there's another problem, or that your child needs some extra help. A podiatrist can help by assessing your child's legs, feet, and walking pattern, and check to make sure they don't need to see a specialist. They can also make sure your child's shoes fit properly and suggest inserts to help your child if the condition is making them uncomfortable. If you need to find a podiatrist you can search on Podiatry NZ's website. Your GP can check to see what's causing your child's pigeon toes, and check to make sure your child doesn't need to see a specialist. Occasionally they may refer a child to a bone (orthopaedic) surgeon, but very few children with pigeon toes need surgery. A physiotherapist can help by providing exercises to balance and strengthen your child's muscles, and to help them improve their balance and control . Written by HealthInfo clinical advisers. Endorsed by orthopaedic surgeon, Canterbury DHB. Page created December 2017. Canterbury Community Health Pathways, Intoeing, retrieved November 2017. Victorian Paediatric Orthopaedic Network – Intoeing in children, retrieved February 2017.